Hospitality Defender, LLC - Oh snap, Yelp app: now post reviews straight from your mobile device! Hospitality Defender, LLC - Oh snap, Yelp app: now post reviews straight from your mobile device! 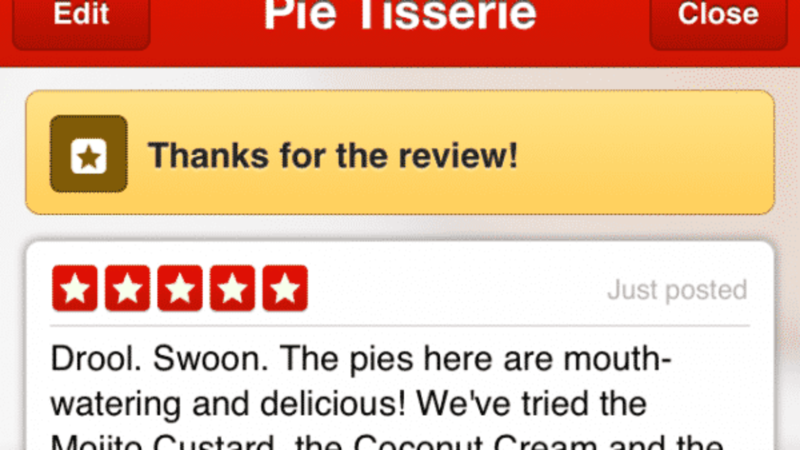 Oh snap, Yelp app: now post reviews straight from your mobile device! Originally posted on the Yelp Official Blog here. Mobile phone usage has come a long way since the days of the hunt-and-peck, shorthand “C U L8R” texts. Nowadays, people are more mobile savvy and are becoming used to contributing long-form content directly from their device. These days, many people are interacting with Yelp solely through their mobile device. Which is why we’re introducing the ability to write and publish reviews on mobile! Yelpers can now contribute their useful, funny and cool reviews directly from their Yelp mobile application (available today on iOS and coming soon to Android). Starting today, Yelpers won’t have to wait until they get home to tell the world why their neighborhood barber is deserving of five shiny stars – they can do it directly from their phones, while they’re on-the-go. What’s more, any photos that a Yelper has taken of the business they are reviewing will now appear in-line with their mobile reviews, similar to how they do on the website. Prior to today, we offered Yelpers the option to leave a Tip after checking in at a business. Tips are still here to stay and are great for bite-sized content (i.e. “great jukebox!”). Mobile reviews are a better option for people looking to go into detail about the factors that contribute to a business’ star rating. To help make sure that these reviews are high-quality and useful, we may post any reviews that are too short as a Tip as we experiment with rolling out this feature. Yelpers can always go back and add in more detail later to flesh it out into a full-fledged review. Given the fact that Yelp’s mobile application is used on nearly 10.4 million unique mobile devices on a monthly average basis last quarter, we know that consumers are already turning to Yelp while they’re out and about. Now, not only can they discover a great business, they can also share their experience with others. Don’t write reviews? That’s ok – most people on Yelp don’t write reviews, they read them – but this new update is great news for all types of Yelpers as it creates one more way for people to contribute content.